The Sun West COP - Cell On Platform is specifically designed to be transportable or fixed depending on customer requirements. COP’s can accommodate customer equipment and/or equipment cabinets. They are lightweight and portable. Ideal for on-site assembly in access restricted areas like; roof tops, parking garages, and under power line towers. Please contact us directly so we can discuss your project requirements. We will work with you to design the perfect solution to meet your needs. The COP Cell On Platform is specifically designed to be transportable or fixed depending on customer requirements. COPS are lightweight, portable and can accommodate customer equipment and/or equipment cabinets. 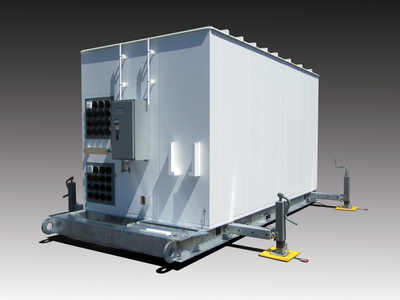 These cabinets offer lightweight modular designs providing for on-site assembly in access restricted areas like; roof tops, parking garages, and under power line towers.